Why Do People Love David Yurman Jewelry? David Yurman was founded in the 1970’s by artists entranced with lines and sculpture, and that love truly shows in today’s jewelry. David Yurman has retained the classic and beautiful elegance of their first ever necklaces in today’s bangles and bracelets. Every David Yurman piece is made with only the finest materials and beautiful design that combines the classic and the modern, making David Yurman a favorite among celebrities and fashion lovers. 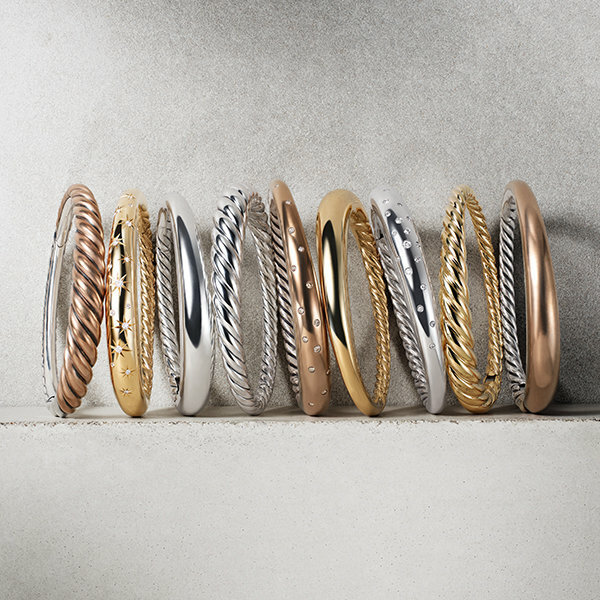 David Yurman offers both men’s and women’s jewelry, and is seen sported by celebrities such as Kate Moss and Anna Ewers. The ultimate elegant piece of jewelry, David Yurman men’s and women’s pieces alike are truly a step beyond your average pearl bracelet or bangle, they are wearable art. [caption id="attachment_10899" align="aligncenter" width="392"] David Yurman[/caption] The men’s and women’s options for David Yurman bracelets are seemingly endless. With bangles in silver, gold, bronze, or a combination, accented with a bracelet pearl, diamond, or clean and simple engraving, every David Yurman bracelet is beautiful, elegant, and the perfect blend of old and new. Pearl bracelets are a perennial favorite, with several different styles offered online. The classic Solari Bead Bracelet is a stylish bangle with a pearl at each end which looks great when stacked with other bangles, or worn alone as a simple piece. David Yurman bracelets can be subtle or statement pieces, depending on what you’re looking for, and their bracelet pearls come in endless options of classy colors and sizes so that you can have exactly the bangle you are looking for. See more men’s and women’s David Yurman bracelets, necklaces, rings, and watches on their website. [caption id="attachment_10901" align="aligncenter" width="472"] Vanity Fair[/caption] Found your perfect David Yurman bracelet? Unfortunately, David Yurman does not ship outside of the US, however, Big Apple Buddy, your personal shopper, can help you buy products direct from the official David Yurman online store and ship them to your doorstep easily, no matter where you are in the world. We offer international shipping to over 190 countries including Australia, Austria, Bahrain, Belgium, Brunei, Canada, Croatia, Cyprus, Denmark, Estonia, Finland, France, Germany, Greece, Hong Kong, Hungary, Indonesia, Ireland, Israel, Italy, Japan, Kuwait, Lithuania, Macau, Malaysia, Maldives, Netherlands, New Zealand, Norway, Oman, Portugal, Saudi Arabia, Scotland, Serbia, Singapore, Slovenia, South Africa, South Korea, Spain, Sweden, Switzerland, Taiwan, Tanzania, Thailand, UAE and the UK. If you would like to buy from the David Yurman online store, simply get in touch and let us know which items you would like to order. We’ll get back to you with a free international shipping quote within 24 hours!